CARL FRAMPTON insists Luke Jackson will regret his trash talk when they finally meet in the ring in Belfast on Saturday August 18. The Australian (16-0) has blasted Frampton in the build up ahead of their interim WBO featherweight title clash at Windsor Park. Jackson has claimed Frampton is past his best, looking heavy in the gym and been critical of the Belfast man’s amateur pedigree. “He can say what he wants, but he has never boxed at the level I have boxed at,” snapped Frampton (25-1). “We talk about levels in this game and there are different levels. I have boxed at a very high level for a long time. “This is the first time he has mixed it at a high level and he is not going to be able to cope, especially coming to Belfast. “I don’t read into odds, but I imagine I am a strong favourite. The bookies haven’t got it wrong because basically I want to do a number on this guy. “He has been slightly disrespectful with the things he has said. He has tried to backtrack, but the bottom line is that he has said these things. It will be Frampton’s third fight under trainer Jamie Moore and insists he has never been happier as a boxer. His gym-mates include Jack Catterall, Martin Murray, new regular WBA world champ Rocky Fielding and close friends Conrad Cummings and Steven Ward who box on the Belfast bill. He added: “The fight is very soon, but this camp has absolutely flown by. It doesn’t seem that long ago when we were in Tenerife and that was a couple of months ago. “It’s probably something to do with how much I am enjoying my boxing right now. “ I’m enjoying myself as a boxer and it is a good craic in the gym. There has been some great wins like Rocky and Martin recently. “There are good quality lads in the gym. We all train hard, but nobody takes themselves too seriously away from the boxing and that is the environment I like to be in. “We’re serious when we have to be, but there is a lot of light hearted stuff that goes on when it’s down time. In only his sixth professional fight, Frampton’s great friend Paddy Barnes challenges WBC flyweight champion Cristofer Rosales. Frampton is the star turn at Belfast’s famous football stadium when he defends his interim WBO featherweight title against Luke Jackson (16-0) on Saturday August 18. “If I beat Jackson, then Warrington or Valdez I will have a title and that puts me in a stronger position, and ready to tackle Santa Cruz. The bill also includes a light-heavyweight clash between Belfast’s Steven Ward and Dubliner Steve Collins Jr. Also in action is WBO European middleweight champion Luke Keeler, Conrad Cummings, KO king Lewis Crocker, Marco McCullough, Sean McComb and Steven Donnelly. CARL FRAMPTON will turn nasty the moment he looks across the ring and sees Luke Jackson in the opposite corner. He gets the chance to silence Jackson (16-0) when he defends his interim WBO featherweight crown against the Australian challenger at Belfast’s Windsor Park on Saturday August 18. Jackson has angered Frampton suggesting he’s over the hill as a boxer and claimed he looks overweight in training. That means an exciting night for 20,000 fans and viewers watching on BT Sport, but bad news for Jackson. Frampton (25-1) said: “He has annoyed me a little bit, but not enough to take my mind off the game and be overly aggressive. “He has annoyed me enough to wanna flatten him and put him out cold, properly. Jackson, 33, has also teased Frampton over his amateur career claiming his experience in the London 2012 Olympics and other major championships betters the Belfast man’s achievements in the unpaid code. Frampton added: “He keeps talking about his amateur career. Who give a f**k what he did as an amateur? He isn’t Vasyl Lomachenko. “Let’s not forget he is based in Australia. If Australia sent a ten man team to box an international against Ireland they would get beat 10-0, and that’s a fact. “His amateur career wasn’t even that good when you look at it. “The reason Australia can send almost a full team to the Olympics is because they box Fiji, Samoa and Tonga. “It is a lot easier qualifying process compared to what Ireland and GB have to go through for the Olympics. TYSON FURY believes that Francesco Pianeta will be in the mood to cause a huge heavyweight upset when they meet. Fury (26-0) faces the Italian at Belfast’s Windsor Park on Saturday August 18, when they share top billing with Carl Frampton. 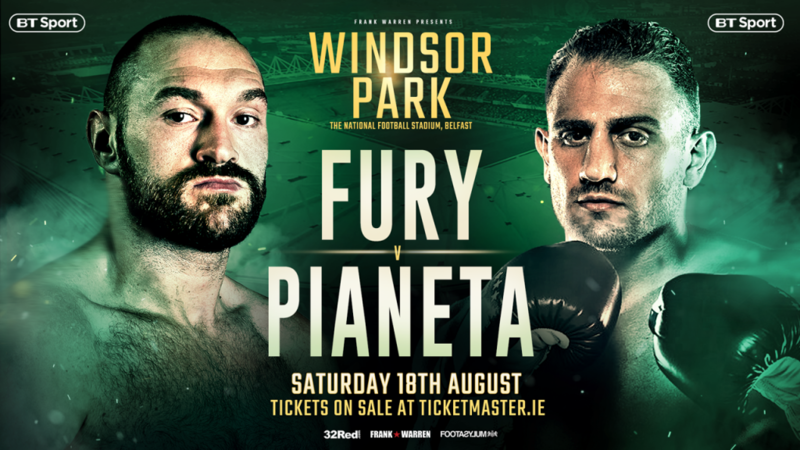 Pianeta (35-4-1), a 6ft 5in southpaw who weighs around 245lb knows a shock win could earn him a third world heavyweight title challenge and ruin Fury’s hopes of dominating the division once again. Pianeta fell short against Wladimir Klitschko and Ruslan Chagaev, but Fury who recently returned after a two and a half year break said: “There is a target on my back. “Pianeta is just one win away from being back right there among the best. Fury doesn’t need to study Pianeta having sparred with him when his rival was an unbeaten world ranked prospect. Former world champion Fury who beat Sefer Seferi on his comeback in June recalled: “I sparred with him in Germany when he was 26 and 0. “He was tough, strong and he is a good opponent – very good. “It was before he went on to fight Klitschko and Chagaev for world titles, but I was impressed. “People say this is a big step up from Seferi and they can say what they want, but Seferi went the full distance with a current world heavyweight champion, Manuel Charr. Tyson isn’t cutting corners setting up camp in Manchester and staying at a hotel on the outskirts of the city away from his family. Fury said: “I’m training hard in the gym every day. I’ve had no time off since the last fight. I’m getting in great shape and really focused on my job. “I can’t wait to get in there and put on a show in Belfast. “Time is flying and it does when you’re having fun. I have a great team around me and we have got everything bang on. I’ve never, ever been this happy with my training and routine. Local idol and two time world champion Frampton defends his interim WBO featherweight crown against Australian Luke Jackson on the bill that is nearing a sell-out. LUKE JACKSON insists that Carl Frampton is on the slide. The outspoken Australian challenges interim WBO featherweight champion Frampton at Belfast’s Windsor Park on Saturday August 18. At stake for Frampton is a likely fight with IBF featherweight champion Josh Warrington but Jackson is out to prove that Frampton is no longer the force he was. Jackson, 33, believes that Frampton (25-1) has dipped as a fighter in his three contests since defeating Leo Santa Cruz two years ago. “Across the board he is phenomenal, but I don’t think he is as good as he once was,” explained Jackson. Jackson’s comments suggesting the Frampton is struggling will rile the Belfast man but he isn’t asking for forgiveness. He added: “We are going to punch each other in the head. I don’t really care if what I say upsets him. “I respect him as a fighter, I respect him as a man but I am coming to beat him, not coming over to be friends. STEVEN WARD plans to reward Steve Collins Jr’s dinner treat by feasting on him again. 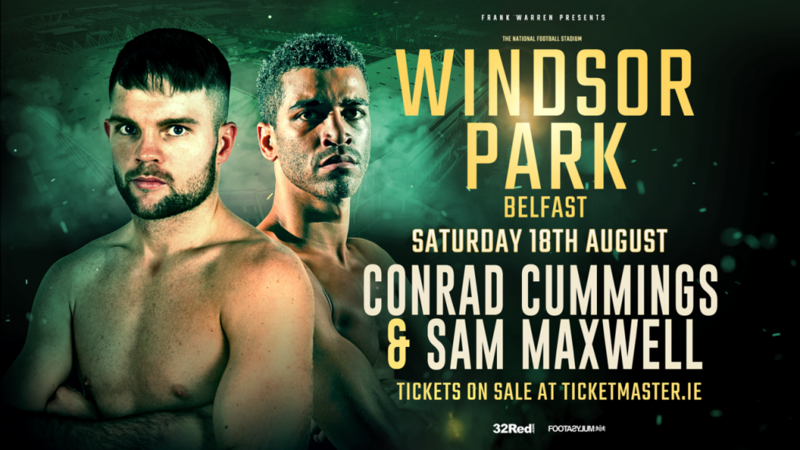 They clash for the vacant BUI Celtic Light-Heavyweight title on Frank Warren’s huge fight night at Belfast’s Windsor Park on Saturday August 18. Ward (7-0) has only met Collins Jr once and then the Dubliner splashed the cash and bought him a meal even though they only met for the first time on that day. “I haven’t see too much of Steve as a boxer, but I know he is a really nice fella,” explained Belfast’s Ward. ‘We were both boxing on a small hall show in Belfast last year and after the weigh-in we went to get some food. “He came across as a good person when we were talking and he actually paid the bill. Collins (12-1-1) hasn’t boxed since December and has had two wins since losing on points against Paddy McDonagh in an Irish title fight 13 months ago. Ward, 28, added: “I did watch the Ward fight and Steve comes forward, is aggressive and will be right in front of me. The BT Sport televised card is topped by Carl Frampton who defends his interim WBO featherweight title against Australian Luke Jackson. Lineal heavyweight king Tyson Fury faces a step up when he tackles two-time world title challenger Francesco Pianeta. In only his sixth professional fight, Frampton great friend Paddy Barnes challenges WBC flyweight champion Cristofer Rosales. 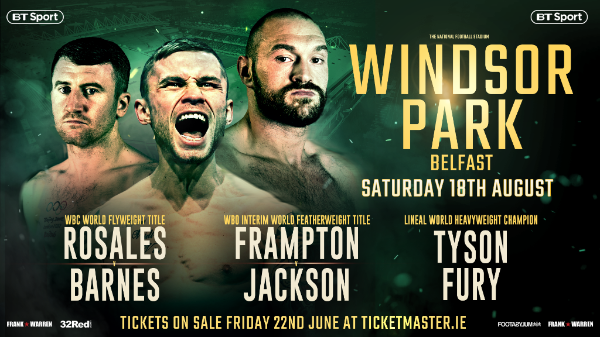 Jackson (16-0) who challenges for Frampton’s interim WBO featherweight championship at Windsor Park on Saturday August 18 says training footage supports his claim. The Australian star said: “I’ve seen some footage of Carl’s training. He still looks sluggish and bit heavy. It seems he is always on a plane going to places. Jackson, 33, has coming to the end of a six week training camp in Sydney and shortly heads to Dubai with trainer Billy Hussein before fight week in Frampton’s back yard. It’s the longest camp ever for the 2012 London Olympian, who says: “I am having a full eight weeks with Billy and had two weeks of conditioning in Tasmania before coming up to Sydney. “Everything is good. My weight is right and everything is ahead of schedule. “I have been doing 12 round sparring sessions and sometimes we have had to cut to ten because they couldn’t stay with me. “I always train hard, but when you are fighting a guy of Carl’s stature I have to be better in every area. “I am pushing hard in the gym and I think it’s gonna show. It’s showing in my training and Billy is very happy with me. 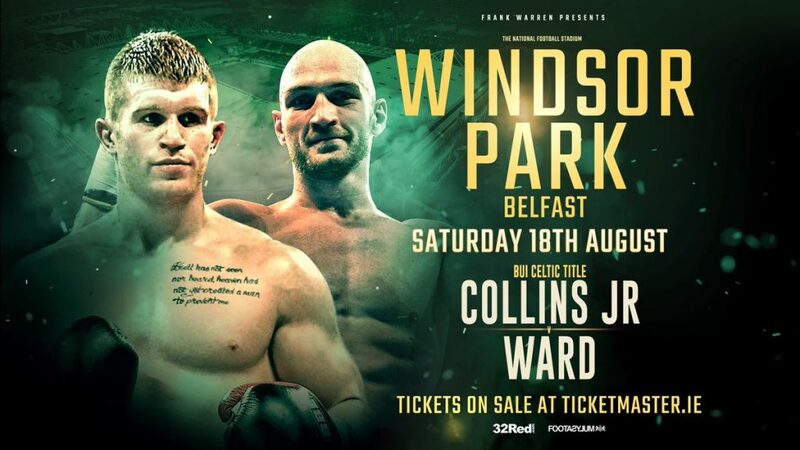 The Coalisland middleweight returns at Belfast’s Windsor Park on Saturday August 18, having been outpointed by Keeler in a vacant WBO European title fight in April. Cummings (13-2-1) believes the chances of a quick return against the Dubliner are slim despite his confidence in reversing the result. He explained: “I would love the rematch, but I haven’t been calling for it because Luke will say, ‘I beat you the first time, why go again?’ and I would be thinking the same had I won. “I lost the fight fair and square, but I would love to do it again. I know the result would be different next time. “I am glad to be back so soon after that defeat. It was a bad night for me. I underperformed massively, but it is what it is and I have to take it on the chin and get back on the horse. “It was a hard one to get over because there was a belt on the line, I was fighting at home and I was looking forward to getting the momentum going after a stop-start time. Cummings, 27, is back in Manchester training under Jamie Moore and living in an apartment with Carl Frampton and Steven Ward. He believes a long four month training camp was one of the reasons behind the loss, and added: “It is great having people like Carl and Steven around me. “They take the mickey out of me, but they give me a lift and it is great being in the same environment as them. “It is not the end of the world and nobody has died here. I will be back to my best. “It is not a loss if you learn from it. I am my own worst critic and for six weeks I was very down, but that is a good thing. It shows me how much I love this sport. “My camp was far too long for the fight and I was overcooked. The BT Sport televised card is topped by Frampton who defends his interim WBO featherweight title against Australian Luke Jackson. Cummings rival Keeler is also on the bill which includes a tremendous light-heavyweight clash between Belfast’s Ward and Dubliner Steve Collins Jr. Also in action are KO king Lewis Crocker and Marco McCullough. Sean McComb and Steven Donnelly also make their professional debuts. CARL FRAMPTON is embroiled in a verbal clash with big fight rival Luke Jackson after the Australian teased him over their amateur achievements. 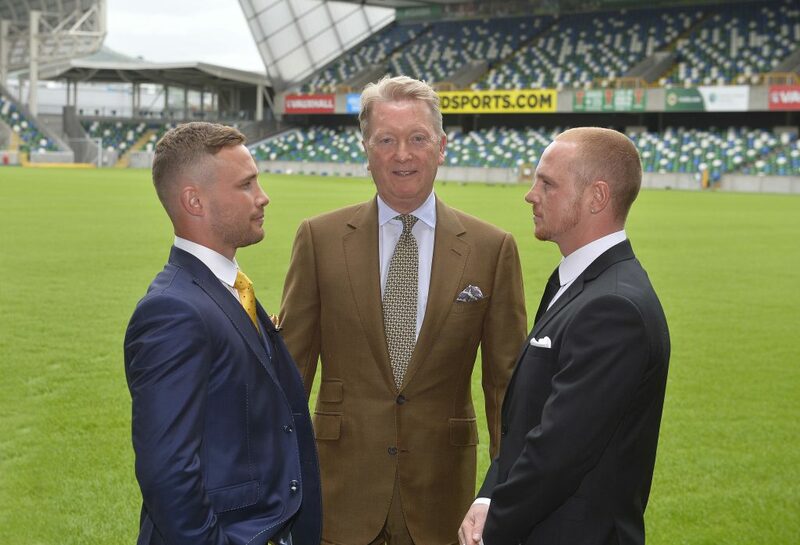 Frampton (25-1) defends his ‘interim’ WBO featherweight crown against Jackson (16-0) at Belfast’s Windsor Park on Saturday August 18 – the biggest show ever in the city promoter Frank Warren has called: “The boxing capital of Europe”. Jackson, 33, captained Australia at the 2012 London Olympics, competed twice in the World amateur Championships and won a bronze medal at the 2010 Commonwealth Games. He said: “I’ve fought some very good guys as an amateur and I’ll be the first to say that as a professional I haven’t fought the guys Carl Frampton has fought. Warren has told Belfast hero Frampton that a win in front of more than 20,000 fans and a huge BT Sport audience is likely to book a crack at IBF world champion, Josh Warrington. But he is already in fighting mode after Jackson who was also a five times Australian amateur champion let loose with a verbal volley. “I’m lucky it’s not amateur boxing then,” Frampton snapped back on Twitter after hearing of his opponent’s comments. Tasmanian Jackson has been in training for two weeks under Billy Hussein in Sydney and says he will leave no stone unturned before moving to Dubai for the next stage of his camp. Frampton, 31, is fresh off a magnificent points win over Nonito Donaire, but Jackson is questioning the validity of that triumph. He says: “I respect Carl and I watched his fights against Leo Santa Cruz. In the second fight he fought the wrong fight. He was trying too hard and it didn’t work. “I watched a few rounds of the Donaire fight and is he is a good fighter, but he is finished. He is not the Donaire he once was. “Nicholas Walters knocked out Donaire and I beat him in the amateurs. I am not saying I could beat Donaire, but you understand what I mean. Also on the bill, Lineal heavyweight king Tyson Fury faces a step up when he tackles two-time world title challenger Francesco Pianeta. Cummings rival Keeler is also on the bill which includes a tremendous light-heavyweight clash between Belfast’s Steven Ward and Dubliner Steve Collins Jr. Also in action is KO king Lewis Crocker and Marco McCullough.